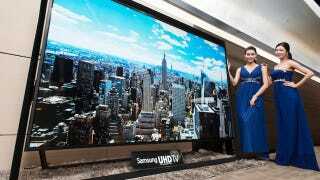 At last year's Consumer Electronics Show, Samsung unveiled the world's largest 4K TV. But its paltry 85-inch size is now dwarfed by a bigger brother, which offers up 110 inches of screen real estate. This things is crazy big. Indeed, Samsung promised a larger version of the TV almost a year ago now, and true to its word it goes on sale today. At least, in China, the Middle East and a few European countries at first, until it starts to roll out across the rest of the world next year. Still, it might be worth the wait. Measuring 2.6-meters by 1.8-meters, it's bigger than a king size bed and should be even more incredible to look at than the 85-inch version.